The Adamed Group Foundation, the organiser of Adamed SmartUP programme, was among the finalists of the 11th edition of “Popularyzator Nauki” (The Science Populariser) Contest. 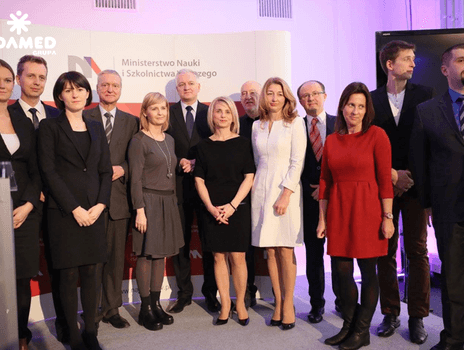 Anna Kosińska, Project Manager of the ADAMED SmartUP programme, received a diploma in the category “Non-scientific institution” on behalf of the Foundation during the Official Award Ceremony, which took place on the 17th December in Warsaw. “Popularyzator Nauki” (The Science Populariser), organised by a press service Science in Poland (Nauka w Polsce) of the Polish Press Agency and Ministry of Science and Higher Education, is the oldest and the most prestigious Polish competition that awards scientists, media professionals, institutions and activists that are passionate about sharing their knowledge and revealing the mysteries of modern science in a manner that is clear and accessible to everyone. Simply being among the finalists is a great honour; it confirms that the steps taken by a given contestant in order to popularise science are highly effective. The 1st edition of the contest took place in 2005. A record-breaking number of 101 application forms were submitted for the 11th edition. The awards were granted in the following categories: “Individual Popularisers”, “Scientific Institutions”, “Non-scientific institutions” and “Media”.